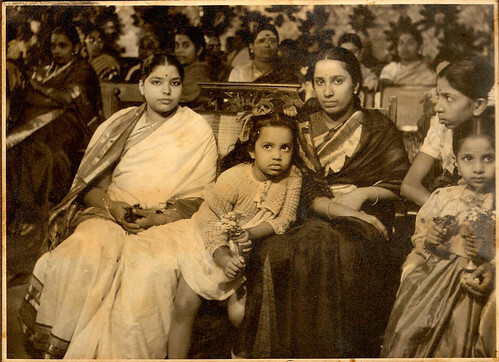 Sabita Radhakrishna, the popular cookbook author from Chennai, pays a tribute to her mother, Mrs. Leela Chander,who was hosted on The Kamla Show to share her memories of Bangalore. Sabita is a food columnist and broadcaster and was associated for over twenty years with Doordarshan and A.I.R. as a script writer and programme hostess. 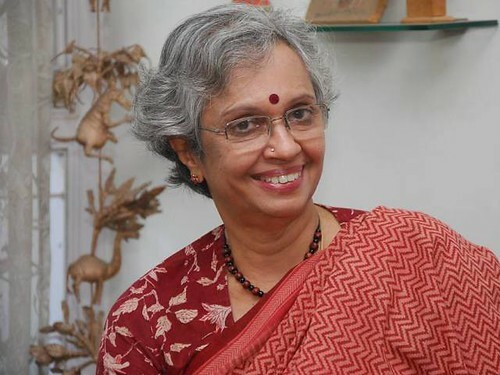 She has had hands-on experience with textiles for over 30 years and is an active member of the Crafts Council of India. She writes: I got married when I was only eighteen. I scarcely managed to imbibe the culinary skills nor learn kitchen secrets from my mother who was busy as a bee. Though I was very interested in cooking, coming as I do from a family of foodies, I couldn’t even make a cup of tea when I got married, much to the consternation of my father who believed that “a woman who couldn’t cook to save her life” could not be a good housewife. He had different standards for his wife, fresh from college when she married him. My maternal grandfather gingerly told his future samandhis that his daughter could not cook (as yet), and my father, so worried that this would go against her, assured his father that he already had a cook and the bride would soon learn the ropes. My father was a doctor in Bangalore, and Mummy, as we call her, worked shoulder to shoulder with him to run the nursing home with 30 beds. 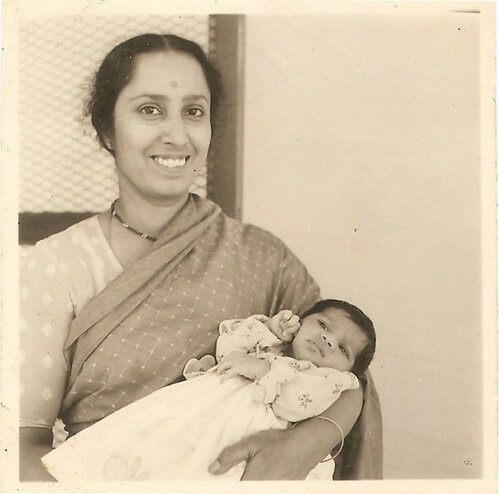 To me, my mother is an unsung hero who worked tirelessly in the background, not looking for praise or limelight. My father made sure she had domestic help, but it was she who masterminded the cooking for the large family, for the numerous servants and for the inpatients in my father’s clinic, including women who delivered babies here, and patients who needed to be supervised after surgery, or just the elderly. Mummy made Pathiyam Saapad (chilli free diet) for the lactating mothers who were pampered for ten whole days, and for the fussy European patients who demanded a western diet. I still think of her bread pudding made in the blink of an eye, and the biryani for 30 people made the conventional way, over wood and hot coal on the lid during those feasts. And now she has handed over the baton to me, and I hope I do her credit! Imagine, she was a carefree college kid who would cycle to her college, rode horses when she was young, and as a tomboy even climbed trees! And sported a blunt cut hairstyle! In her younger days, Mummy was an excellent seamstress and I still have her old Singer machine on which we learnt to sew. Her embroidery was beautiful and embroidered sheets and pillow cases were part of my wedding trousseau. She painted and sketched when she found the time, and it is from her that I have inherited what little writing skills I have. Sometimes I feel sorry that she was trapped in a different era, one of conventionalism and orthodoxy, and if she had been given the encouragement and opportunities that one has today she would have gone places. It does not matter really because she has lived a full and meaningful life and whatever she has done or accomplished is worthy of praise though she does not seek it. She has a wide circle of friends who are actually our friends, since most of hers have passed on. My culinary skills and repertoire of traditional recipes have been handed down from my mother, during those days when there was no email, no mobile phones, and for that matter, no phone in our home in distant Bhopal. I struggled with the complicated recipes, determined to master them as I knew full well what the end products looked like. This post is a tribute to my mother, Smt. Leela Chander, who has influenced my cooking with her culinary skills and penchant for perfection, at times driving us to despair for not being able to match her fastidiousness. The coconut or any other masala should be ground to a satin patina, the vegetables should be cut according to right specification, and oh, the vadais she makes have to be seen to be believed. Every vadai that is made by Mummy will be a perfect circle, and if they are ulundu vadais, the hole in the centre would make cute little concentric circle, and look like they have been taken out of a single mould, and no one would suspect that she rolled the batter into a perfect ball, patted it into shape into a vadai over a plantain leaf and slip it gently into the hot oil without compromising on shape. Her curds are something to die for, though they are made from Aavin toned milk, with all the cream removed after the milk is boiled. Mummy’s curds make a good substitute for sour cream and sometimes even cream, and makes the best cream cheese. My little grandson who has been fed on Dubai’s Labaan,a deliciously sinful creamy yoghurt, remarks that there is no curd to beat his great grandmother’s. Would she consider selling them in Dubai, if he did the marketing? Out of the mouth of babes, you can say, as he was only ten years old or younger when he said this. My mother has been living with us for the past 30 years, and is a pillar of strength to my husband, my children and grandchildren. Age does not seem to be a barrier or any kind of deterrent to enjoy life, and we are all so fortunate to have her with us. God bless Mothers, what would we do without them? Click to view the Potato & Dill Fry Recipe & Masala Uppumav Recipe by Sabita. Did you enjoy reading this tribute? We would love to hear from you. Share with us a few lines about someone whose cooking is precious to you. Click the comment form below. As always, all your articles on real and fabulous people appeal to me and this one is no exception. The writer is blessed with a very talented mother and looks like the apple didn’t fall far from the tree! Pictures were a feast for the eye. Thanks for this presentation. Very well expressed and comes from the heart. Your love and relationship with Aunty was more of a friend .I love the way she called you Sabi !She will always live in our mind and heart.Love you.Thanks for sharing those lovely pictures.